First, let me say that I'm sorry to hear that you've decided to sell your houseboat, but I guess it could be for a variety of reasons such as: you want to upgrade, downgrade, change hobbies, or maybe other reasons. How to sell your boat FAST, and for MORE money. Want the Top-10 Selling Tips? "Knowledge is a Powerful Thing", so download it and you'll instantly gain a lifetime of experience. trying to sell their houseboat. Learn the tips that the PRO's use to stage their boats in the best light, and learn how to get Top Dollar for it. 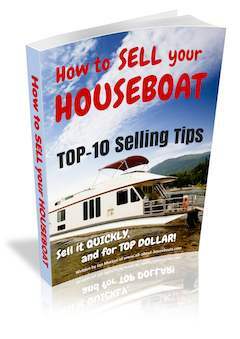 If you're selling your boat this ebook (pdf) is designed to help you put your houseboat for sale, and "Sell it Quickly" and "Get TOP Dollar" for it. With 30+ years of sales experience, I can guide you through the steps to make it easy, quick, and a profitable experience. Do you want to sell it fast, and for more money? After a few month's work, and 21 pages later. I truly want to answer your boat-selling questions and after a few month's of work putting it all together, this ebook can now help you Sell your Boat like a PRO. This downloadable eBook is an honest, straight-forward, easy to read guide, that'll share a lifetime's worth of sales & boating experience with you. It will give you ALL the tools & blueprint to get the most money for your houseboat. ... reduce weeks of research to one weekend. ... answer all your selling questions in one place. ... help you avoid those costly seller mistakes. ... benefit from my 30+ years of sales experience. What's Covered in the eBook? The condensed eBook (21 pages) is filled with important strategies & tips to guide you through the process of preparing, listing, staging, and showing your boat. Everything you need to make the whole selling process a huge success. Preparation tips on getting your houseboat 'really ready' for all the prospective buyers. How to multiply your sales efforts by 10 FOLD with these simple to do tips and tools. Tips & strategies on how to make your boat stand out amongst the other boats for sale. Learn the selling basics of making the buyers WANT your boat, and willing to pay for it. The 'realistic look' at what the current offer to purchase really means in the long run. Also includes the Top-10 Selling Tips, and a free 'Boat Bill of Sale' form to close a deal. Don't Miss a SALE, get your copy Now!
" Ian, the tips in your ebook definitely helped us sell our houseboat, and we truly got top dollar for it. The new buyers are so proud of their new boat. Regards, Cindy and Joe, GA "
Get the step-by-step eBook filled with 21 pages of detailed steps, tips, and powerful techniques the Pro's use. Don't Miss the BOAT, as this is a limited time-offer, with selling tips that are worth 1000's $$. It's totally safe and 100% secure purchase via PayPal. Download the PDF ebook now to your Computer, Desktops, Tablets, iPad's, Smartphones, Kindle, portable Laptop, and most devices. Don't have PayPal, no problem. 100% Safe, 30-day No-Risk Guarantee: If you’re not satisfied with this eBook, just contact me within (30) thirty days and I’ll issue you a 100% refund. You May Have Some Questions? eBook Format: it's a PDF, now what to do? Is 'Sell your Houseboat' ebook for you? Here's what you'll learn in the ebook. Our 100% Safe, No-Risk Guarantee. Read what other boaters are saying. PayPal, don't have account, no problem. The PDF ebook is simple because you can download right away and read it on your Laptop, Desktop Computer, Kindle, iPad, Smartphone, Tablets, and most other devices. Once "downloaded", an internet connection is no longer needed, and you can "sync it" to other devices. Right after your PayPal purchase you'll receive an email with a "download link" so you can download your eBook and start reading it right away. It's immediate, and there's no waiting for a printed book to arrive by mail. If you’re not satisfied with this eBook, just contact me within 30 days of your purchase date, and I’ll issue your 100% refund immediately. Your eBook purchase is 100% safe and secure – and 100% risk-free. You can add items to your cart from any shopping Add to Cart button. Simply click on the Add to Cart button for each item you'd like to purchase. Click on the "View Cart" button. When you click on the View Cart button, a little checkout window will pop up to show you the item you've added to your cart, plus a yellow button saying Check Out with Paypal. 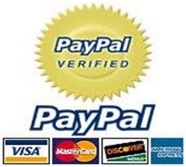 * Even though you're paying with your credit card, click that yellow Check Out with Paypal button. After clicking that yellow Check Out with Paypal button above, you'll wind up at a Paypal screen. Now on that screen, look below the yellow Log In information. * Click the link called: Don't have a PayPal account? Now you can check-out/pay with only your credit card, without needing to set up a PayPal account. If you need help or have questions about the checkout procedure, please contact us via Product Support. We'll be glad to help! Is The eBook For You? You're here because you want to 'Sell your Houseboat'. You don't want your houseboat to take forever to sell. You're here to avoid making very costly sales mistakes. You want to get the maximum selling price for your boat. You value your time, money, and surely your families sanity. Take advantage of my years of sales & boating experience.